A production line is an efficient arrangement of workers or machines in a factory to manufacture or assemble products. It divides each or a limited number of tasks to assigned workers or machines before getting passed down the line for the next step, instead of making one worker or machine complete the whole process. This enables factories to speed up the whole manufacturing and assembling process and meet their quota with reduced labor hours. 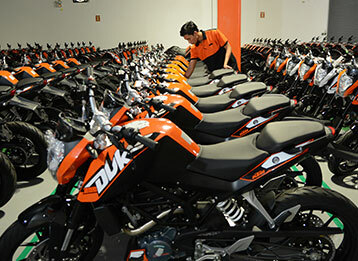 IMI, as a global outsource manufacturing company, does the motorcycle assembly for the Austrian motorcycle giant KTM AG, now in full swing at the company’s state-of-the-art manufacturing facility at Laguna Technopark, Sta. Rosa, Laguna. A joint venture between KTM Asia Motorcycle Manufacturing Inc. (KAMMI), and Adventure Cycle Philippines Inc., our cutting-edge Laguna plant does motorcycle parts assembly of four (4) KTM models. With our expertise in manufacture and assembly, as well as our effective production line, we are capable of producing around 115 motorcycles per day at IMI. We direct our passion at solutions, not just at technology per se."